When does determination become delusion? Number 10's answer to that may be "not yet". The aspiration, strange as it sounds, for some time now has been to prove to MPs that the deal is the least worst of all the options, for time to expose the impossibilities of the new compromises some MPs seek politically for the Tory party, and for the cost of a long delay to Brexit to be too great to allow Parliament to find a new way too. Those allies the prime minister still has do believe - from the bunker - that there is still a chance to salvage something that looks like the prime minister's deal from the wreckage. 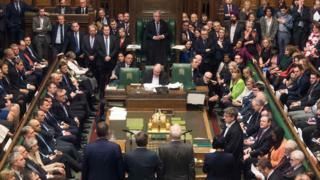 Meaningful vote two and a half was another defeat - but the numbers of those against Number 10 were falling away. Time - and stubbornness - may yet prove energetic critics wrong. But is the coping strategy of "just keep trying" realistically enough? Ask Tory MPs and you hear a variety of "we're stuffed", "she's over", "it's a disaster". Labour MPs are simply not yet moving in the numbers Downing Street had long hoped for. Recent attempts to reach out have provoked more frustration than collaboration. And with the timetable for Brexit slipping away, the prime minister might soon be forced to conclude that the deal she believed in is truly gone. There may never be a moment of compromise with her at the helm. Theresa May never wanted to be only the Brexit prime minister. But the entrenched divisions she inherited, and the miscalculations that have led her to this point, mean the eventual outcome of this chaos will not just be up to her, and will forever mark her moment in charge.